Welcome to the base of operations for 28th Squadron, The Mad Pancakes. Welcome Aboard! You're the Pancake Crazed Marine to visit our beloved Squadron! We are a local division of the 96th Recon Battalion. 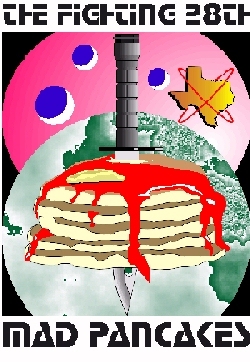 If you are a Space Above and Beyond fan, and you live in the great state of Texas, you are eligible to join the MAD PANCAKES. If you Are not from Texas, love the show, or are intrested in joining a unit in your area, WE would love for you to visit and log in in our log book below. Our mission is to spread the word about a great show, and to do the best we can to bring said show back. In between that we will have a chance to socialize, and discuss the show. Sound good so far? Excellent...then register now with our official LOG BOOK! If you want to see who's already on the list, check out ourMembers page ! If you are interested in joining and have questions, send mail to LT. Col Niki of The Mad Pancakes . You can expect a reply within 72 hours. Do not stand at my grave and weep I am not there, I do not sleep, I am a thousand winds that blow, I am the diamond's glint on snow, I am sunlight on ripened grain, I am the gentle autumn's rain, When you awaken in the morning's hush, I am the swift, uplifting rush Of quiet birds in circled flight, I am the soft stars that shine at night, Do not stand at my grave and cry, I am not there; I did not die. It's as easy as eating pancakes.. This is the E-mail Address for FOX, It may not mean much, but they do have to read their E-mail, and count it. So if your not in a hurry and you wanna vent your opinion, Then I urge you to write! Be vehement, but don't be rude or crude, and don't threaten to boycott. The address is [email protected]Semper Fi!! By the way, the FOX site for SPACE is changed to this https://bbs2.iguide.com/cgi-foxworld/podium?operation=treegen&virtual =saab/ So write it down and go for it! There is still a Space Board, the format changed, but it's still there! Good Luck!! I just talked to Peter Roth's office, and it seems he (and his staff) are big fans of the show. In fact, Roth was one of the people who first Okay-ed the show when he worked at 20th Century Fox Television. According to Roth's office, Fox Broadcasting (FB) would be willing to listen to a pitch from Glen Morgan and James Wong to bring the show back. FB primary concern is the fact that many of the cast and crew may have moved on to other projects. This is not to say that if M&W pitch a renewal that it will happen, but it is a sign that FB is willing to listen. Coupled with XXCFT's willingness to produce the show if a network purchases it, this is very good news indeed. I called Morgan and Wong to tell them the news. It didn't seem as if they knew about this change of events with Roth at the helm. We can only wait and hope that M&W wish to continue production of the show and decide to pitch it to FB, and that FB decides to pick up an option on Space putting XXCFT back in the Space Production business. We are asking that all letters be sent to the 72nd's intermediate address so that we can have them all arrive at the same time. We would like to time this right, so if the letters could arrive before or during the week of October 21st - 25th, that will be the best for us in getting everything done on time and as planned. James Morrison recently finished filming an early episode of Millennium. His character's name is "Jim" and is apparently a very very good character; rumor has it as good as McQueen. The character is *not* recurring as far as anyone has said. Tucker Smallwood will be appearing in the October 11th episode of The X-Files. He plays a small-town sheriff named Andy Taylor. You can also reach this gateway via your email program. Here's how it works: You send your message to. It then gets compiled along with all the other messages for the day, into one large message, and is sent to her real email address. ***PLEASE NOTE***is not her real email address, just a gateway address. In case you are concerned - no one reads these messages but Kristen. Sci-Fi & Fantasy Models magazine, issue #15 from England is running an article on the props and Chig make-up and armor produced by Modelsmiths. They are planning at least one additional article on the effects of the show. Also Science Fiction Modeler out of Australia is doing something on the show, specifically, the 1:1 scale Hammerhead that was build for the premiere's big roll-out scene. Both magazines are available in limited release in the US. 4000 Warner Blvd. 5555 Melrose Ave.
COMING SOON: TRIBUTE TO RAY BUTTS, THE COMPLETE E-MAIL LIST FOR THE 28TH (already in operation and growing everyweek) ...AND A WHOLE LOT MORE!!!! The characters and situations of the television show SPACE: Above and Beyond are the creations of Glen Morgan and James Wong, Hard Eight Productions and Fox Broadcasting Network. This site intends no copyright infringement and has been created to lend support to the cast, crew and fans of SPACE: Above and Beyond. Counter was Provided by www.digits.com.